The Acorn House Cookbook is not your average "farm-to-table" cookbook. You will find no pictures of content chickens running about, in fact you will find not pictures in the book. It is old-fashioned in that way. But that might just be a factor in making it timeless. Arthur Potts-Dawson is a pedigreed chef. He made a name for himself at the River Cafe, which seems to be the incubator of renown British chefs as well a fine restaurant. Fellow River Cafe alum, Jamie Oliver made Potts-Dawson the executive chef for Jamie's Fifteen restaurant. 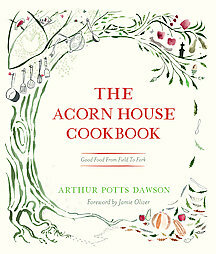 Potts-Dawson, like many young chefs, didn't want to merely talk about sustainability, he vowed to put it into practice at The Acorn House. His commitment for the environment stretches from the kitchen to encompass all aspects of his restaurant. He has constructed an eco-kitchen, complete with wormery. The Acorn House Cookbook gives readers an outline of these environmental principals, from ways to make one's own kitchen environmentally friendly, to growing tips, shopping ideas,and even where to procure your own wormery. All this ecology might fall on deaf ears if his food wasn't so good. In an age of hugely overproduced cookbooks, this one a bit hard to get used to. (We confess, we wanted to see the wormery in action.) The lack of frivolity in glowing pictures, lets one concentrate on the beautiful, fresh foods offered up. Roll the pasta into two sheets, thin enough so that you can just see the colour of your palms through them. Keep covered when not working with them. Wash and cut the herbs into small pieces, and place in a bowl. Grate in some of the nutmeg, then mix in the ricotta and parmesan. Season well. Arrange one pasta sheet on the work surface. Place tablespoonfuls of the herb mixture at 2.5cm intervals on the pasta. Spray (use a clean plant mister) between the piles of mixture with filtered water; this is better than brushing, as it prevents the pasta from becoming too gluggy. Cover with the second sheet of pasta, and press down between the mounds. Make sure there is no air left in each, as heated air expands and will blow a hole in your ravioli. I always make square ravioli, as there is no waste. Press the edges of the pasta to seal. Place the ravioli in a large pan of simmering filtered water for 3 minutes, until they bob back to the top. Serve with melted butter, the parsley, some more nutmeg and grated parmesan. This may also be the only cookbook you will run across using the word "gluggy."